Halloween coincided with midterms and Thanksgiving coincides with the end-of-quarter rush. This coming week I have a protein supplements debate presentation, a short research paper (for the same class as the protein debate), and an op-ed draft due, plus I have to moderate a class discussion in the same class as the op-ed. The short research paper also has a presentation component, but that's not until next week, along with a 20 page paper critique/study design paper for another class. As soon as those are done we get to study for our Epi final and start writing our metabolism final. All that to say that Thanksgiving wasn't exactly carefree this year. We kept things very basic. Turkey breast, stuffing, mashed potatoes, broccoli, rolls, gravy, cranberry sauce, and pumpkin pie. I haven't made my own rolls in years since we have bakeries here that do a much better job than I do, so everything was pretty quick and easy. 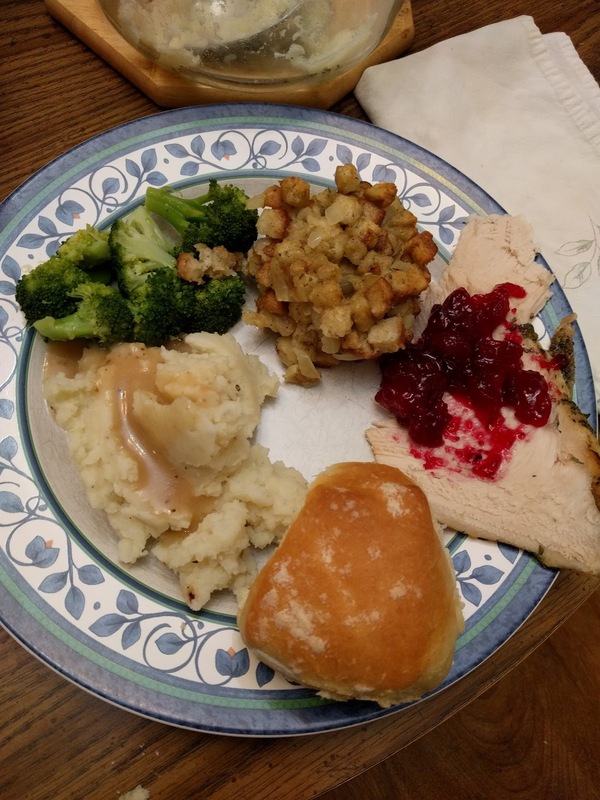 I didn't make huge amounts of anything, so we had enough leftovers to last a couple days and that's it. Mal surprised us and actually ate turkey this year as well as rolls. 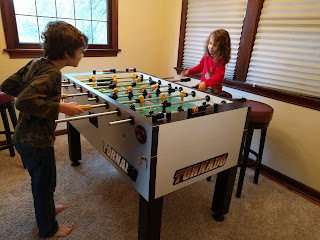 Usually he hates all Thanksgiving food, so eating turkey was a big deal.The boys watched TV pretty much all day, with the occasional helping out with cleaning this or that or playing of foosball. It's really not a fair match-up, but maybe one day it will be. Ryan and I cleaned the house and cooked. Mal stayed in his pjs all day (and the whole of the next day too). I'd thought about offering to have cohort friends over or trying to get together with some of our friends for the day but ended up glad that we just kept to ourselves. I'm sure we'll have plenty of opportunities to catch up with friends over winter break. When our meal was over we all helped wash dishes before enjoying pie and Dr. Who. The rest of the break was much of the same, except with homework thrown in for me.